Washington - Donald Trump can thank male voters for his big victory in the Indiana Republican primary. The billionaire won the support of Republican men by a more than 25-point margin over Texas Sen. Ted Cruz, who dropped out of the presidential race after his defeat Tuesday night. On the Democratic side, former Secretary of State Hillary Clinton was drawing the support of black voters and Vermont Sen. Bernie Sanders was attracting younger voters, according to early findings from exit polls conducted for The Associated Press and television networks by Edison Research. The exit polls also show that Democrats say they’re energized and optimistic about their party’s nomination process, while Republicans say they’re worried their party is being torn apart. Indiana voters also overwhelmingly expressed concern about the state of the U.S. economy. And most say they don’t see much of a fairness issue in the GOP nomination process or much of a difference in the political tactics employed so far by candidates in the presidential race. Trump’s outsider appeal helped fuel his Indiana victory. Six in 10 Indiana Republicans said they want the next president to be a political outsider, and those voters overwhelmingly supported Trump. Trump also was supported by most GOP voters who say they’re angry about the way the federal government is working. Trump won nearly 6 in 10 voters over 45 and a similar percentage of those without a college degree. Just over half of self-identified Republicans and independents voted for Trump, as did 6 in 10 Democrats voting in the Republican primary, who made up about 5 percent of GOP primary voters. Trump’s margin of victory was in the single digits among women and more educated voters. Clinton was supported by three-quarters of black voters in the Democratic primary, while Sanders drew two-thirds of voters under 45. Voters consider Sanders more inspirational and honest, but they see Clinton as more realistic and electable. About three-quarters of Democrats consider Clinton’s policies realistic, while two-thirds say the same of Sanders. More than 8 in 10 say Sanders is honest, while just under 6 in 10 say the same of Clinton. Most see Sanders as the more inspiring candidate, but Clinton is seen as more electable against Trump. More than 7 in 10 Democrats in the state say they’ve been energized by the nomination contest between Clinton and Sanders. But nearly 6 in 10 Republicans say they think their party has been divided by the battle being fought by Trump, Cruz and Ohio Gov. John Kasich. In fact, half of those who voted for Cruz or Kasich on Tuesday night said they would not vote for Trump in the general election. Half of non-Trump voters would be scared and another third would be concerned about Trump being president. About 7 in 10 Democrats say they would be excited or at least optimistic about either a Clinton or Sanders presidency. More than 4 in 10 Indiana GOP voters are concerned or scared about the remaining Republican candidates becoming president. Still, most GOP primary voters say they would probably support Trump, Cruz or Kasich in November. Trump and Sanders have both criticized their parties’ nomination processes and gone after their opponents for what they call unfair tactics. But Indiana voters on both sides don’t see much of a fairness issue in the presidential race. Most Democratic primary voters don’t see either Clinton or Sanders as having attacked the other unfairly — about a quarter say Clinton has and 2 in 10 say Sanders has, exit polls show. Republican primary voters were more likely to say Cruz ran the most unfair campaign. Just over 4 in 10 say that of Cruz, and just over a third say that about Trump. When it comes to the Republican nomination process, only a third of GOP voters say it’s been unfair. But half of them feel betrayed by their own party leaders. Voters from both parties say the economy was weighing heavily on their minds as they headed to the polls. More than 9 in 10 Republican primary voters and more than 8 in 10 Democratic primary voters are either very or somewhat worried about the economy. Asked about some specific economic issues, more than 6 in 10 Democratic primary voters say Wall Street mostly hurts the economy. They’re slightly more likely to say trade with other countries hurts the American economy than that it helps. 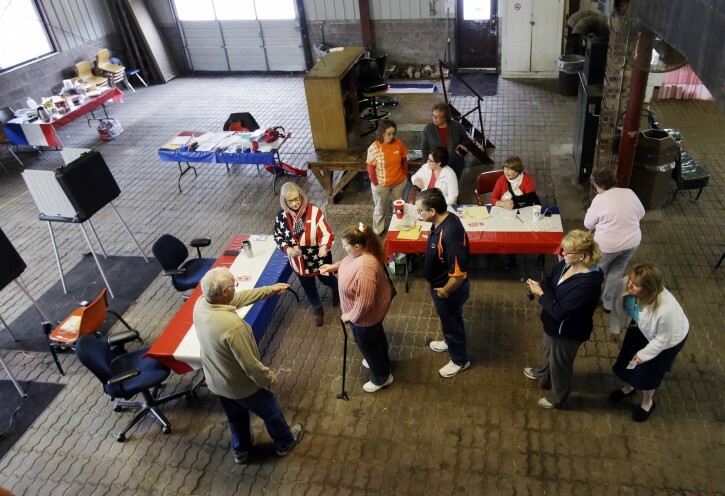 The survey was conducted for The Associated Press and television networks by Edison Research as voters left their polling places at 35 randomly selected sites in Indiana. Preliminary results include interviews with 1,324 Democratic primary voters and 2,092 Republican primary voters. The results among all those voting in each contest have a margin of sampling error of plus or minus 4 percentage points.